This post is sponsored by Legacy Locators. 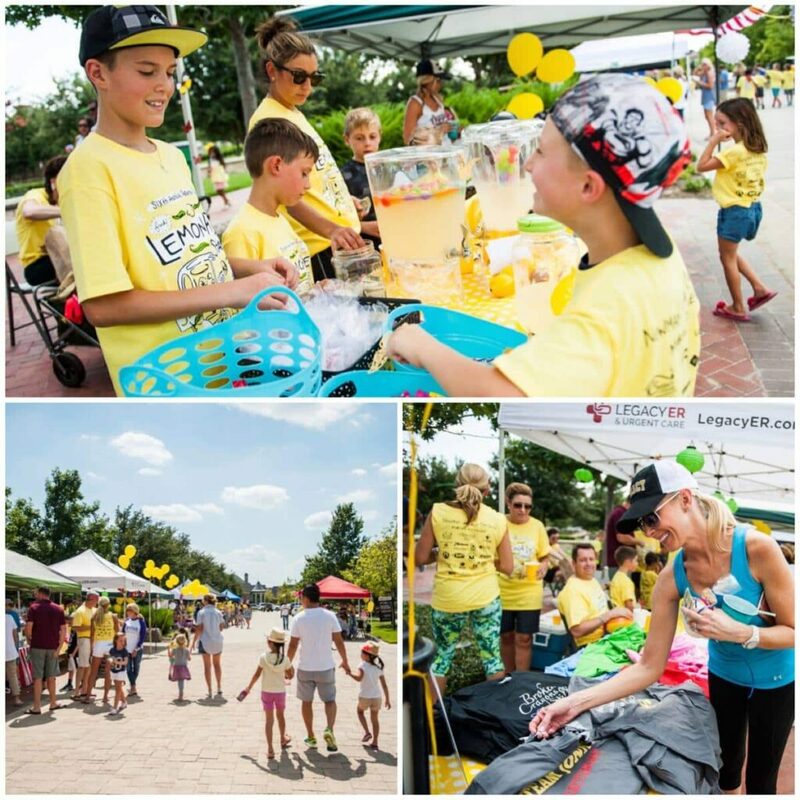 Frisco is an ideal place to live for families. The vast majority of single family-use homes function as busy operating centers for parents and kids to navigate their days filled with school, work, sports, activities, play dates and social gatherings. However, there’s another fraction of our population whose entering the empty nest season of life. While their children may have grown up and moved out to start college or a career elsewhere, mom and dad still want to make Frisco their home. Equally, with the arrival of transplanted young families to our city, many grandparents are also relocating from out of state to be closer to their grandkids, yet don’t require a large single-family dwelling. Either scenario presents the opportunity to consider a different choice of residence. Enter the idea of apartment living as an affordable solution. While less square footage means lower utility bills and less space for clutter to take root, the process of paring down to downsize your living space can be even more exhausting than a regular move. We’ve had several clients who have made this change in their living situation to simplify their lives. Getting rid of unnecessary items and furniture becomes an opportunity to reinvent your home! So how does someone focus on simplifying their lives, while also navigating a broad search for the right new home? Legacy Locators can partner with you to find the right type of apartment living in Frisco while you focus on clearing the clutter. Their seasoned apartment locators can assume the responsibility for the research and legwork of finding the right apartment space and location for you. To begin, all you have to do is complete their search form and they’ll do the rest. Their services are entirely FREE. This then gives you the time to concentrate on the tasks of downsizing and preparing for your new, simplified life. While Legacy Locators is busy finding a match for your desired amenities, budget and lifestyle, you can follow these tips for taking control of your possessions and embracing a life of less. From the start, it’s probably best to adopt the method whereby you separate out all your existing items under headings of Gift, Sell, Donate, Trash. You can start by using a color-coded sticker system under the above headings on each item as you move room by room to evaluate. Downsize the big stuff first. How many beds do you need in your new home? Does the new space accommodate a dining table or just a kitchen dinette? Two chests of drawers in each bedroom or can you adjust to one? Could a 3-piece living room suite fit in an apartment? Are side tables and coffee tables necessary at every corner? Look at each room with the future space in mind, and measure things, deciding which pieces will work better in a smaller space. Track how often you use certain items and apply the ‘one-year rule’. For example, in the closet, if there are clothes or shoes not worn in a year throughout the four seasons then it’s probably time to bid them goodbye. Take the same approach in the kitchen as chances are the current kitchen in a single-family home will have been larger than an apartment (and that means less storage, drawer, and cupboard space. To review your stock of utensils, grab two boxes or even drawers in your current kitchen. As you go about your routine, place in one empty drawer or box the items you use on a daily basis. If after a few weeks there are items left that you never seem to use then it’s time to donate or pass on to someone who will make better use of it. Minimizing duplicate items speaks for itself. While it’s nice to have two or three of the same items in various parts of the home for convenience (one upstairs and one downstairs, one in the master bath and one in the guest or children’s bathroom), downsizing means you don’t need three or four of the same items around the home anymore. Here’s a quick list of items we tend to accumulate extras on that you could consider paring down: Sets of dishes and glassware, Tupperware, mixing bowls, large serving platters, coolers, household tools, extra blankets and sheet sets (maybe keep one heavy and one light, per guest bed), and a coat for each type of weather. I’ve had clients make a small fortune on items that simply clutter their environments! Maybe are some items you just can’t bear to see go into the donate pile, but they’ll take up much-needed space in your new smaller home. Think about special people in your life who can take family heirlooms or sentimental items. That collection of Victorian dolls, a book series, large pieces of furniture like a rocking chair or grandfather clock… Call various family members who understand the sentiment and family memory behind the item and see can they house it comfortably. Documents, photographs, CD’s, DVD’s… Digitize whatever you can. If you have a lot of family photos, consider a gallery wall of favorites and work with a professional service or family member to help you digitize the rest. Go green and paperless by scanning those filing drawers and boxes of documents you really don’t need taking up space. Consider various storage options within a smaller space. There are some great ideas to be found in stores and online to implement a more effective storage solution and make space go further. Hang additional shelves or hooks in busy areas of the home like the kitchen and bathroom. Seek out organization tools that expand storage in closets and cabinets like under-bed storage boxes, vertical clothing hangers, and behind-door shoe storage. If, after sorting most rooms and items, you still feel you can’t quite bring yourself to donate, consider using a small off-site storage solution for the short term until you get through the transition and relocation process. However, set accumulation limits for yourself. Don’t use this option for all items as then you will never truly downsize properly and only be faced with large storage bills! Rent only a small unit and decide on only what will truly fit in there. Once settled in your new apartment space you can then go through this unit and purge again. Paring down can be both stressful and emotional especially if you have spent decades in a large home. Organizing, purging, and donating, however, always presents a “feel-good” factor. There are bound to be old clothes and other items that might be of better use to someone else in addition to helping you feel like you are giving back. With Legacy Locators as your expert partners, you can trust they’ll find you the right space to move onto the next exciting and liberating chapter in your home life. The Great Equalizer Among Strangers – Industrial Cigar Co.
Their story is unique, and best heard while sharing a cigar with one of the owners. Which is a likely scenario, since the owners of Industrial Cigar Co. are in the shop on a regular basis, not only operating the business but, enjoying a cigar and engaging with the members. 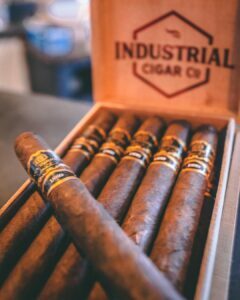 Six years in the making, Industrial Cigars is a family-owned and operated shop, each member of the family bringing a unique set of skills that contribute to the business in complementary ways. The inspiration began years earlier when Dave Frakes was surprised, one evening, to find his grown sons enjoying cigars together. Something he had enjoyed personally for years, he had always isolated his cigars to the golf course. Upon realizing their shared interest, smoking cigars became a family affair. One that included great conversation, laughter, holidays, and a break from the daily grind of life. This family bonding would soon become a family business. Prior to opening in 2017, the Frakes family invested extensive time visiting international lounges, working in the industry, gleaning from business leaders, and learning about the culture through first-hand experience in tobacco fields abroad. In 2017, six members of the Frakes family opened the doors of Industrial Cigars in Frisco. 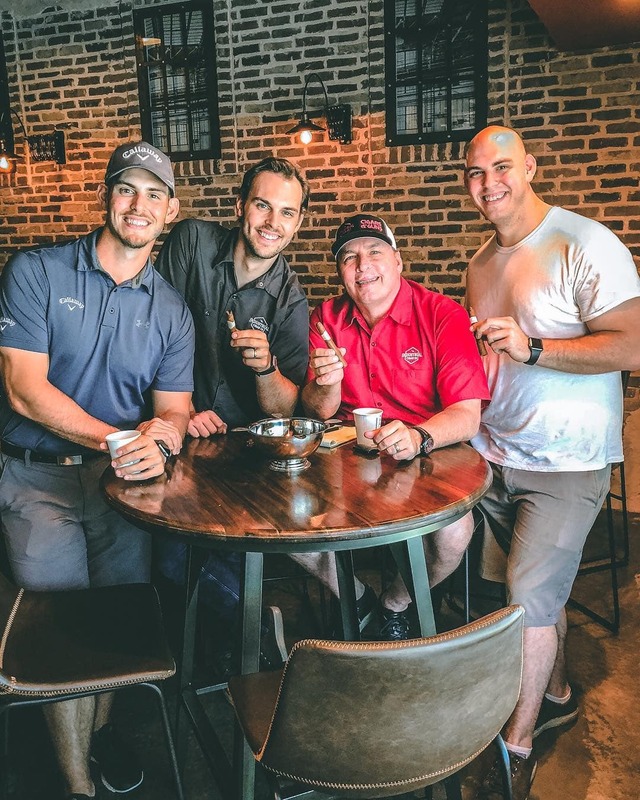 Brandon, Nathan, Andrew, Dave, Ale, and Beglije had the vision to foster an environment where you can not only enjoy a good cigar but where you can also feel at home. Industrial Cigar Co. is a hospitality-driven cigar lounge that offers a public and private lounge space, 2 full walk-in humidors, premium accessories, and a state-of-the-art air purification system. Though the business model is based on private membership, the retail aspect of the lounge is open to the public. Step inside of Industrial Cigars and you’ll find people of all professions and interests…blue collar, white collar, no collar…finding unity around a handmade product that allows them the chance to spend an hour or so forgetting the daily pressures of life. You’ll see new friendships formed, encouragement given, and connections made. Simply put, the experience goes beyond the four walls of the shop. Walk into Industrial Cigars and a few things are certain. You’ll be greeted with passion. As patrons themselves, the Frakes family understands the enjoyment and uniqueness of cigar culture. They’re deeply focused on the people and the experience, as much as they are in providing an impressive cigar selection. You’ll experience the authenticity of cigar culture. Expect to meet people of all ages and backgrounds enjoying conversation, swapping stories, sharing favorite cigars, and even striking up new business relationships. You’ll want to come back. The amenities and membership options are just the beginning of the experience. Often, it’s a refuge. Someone comes in who may be experiencing the pressures of life – desperate for some peace of mind, an ear to vent to, or some wise advice to help guide them through a tough decision. So how, exactly, does this unique culture develop? Brandon Frakes, head of Marketing and Branding for ICC says that when you’re in the shop, there’s an instant commonality between guests, and there’s an easy conversation starter. “Hey, what are you smoking?” It cuts through the small talk. Cigar culture, in general, is very inclusive. It’s a very relationship-driven culture. Hospitality-driven. Experience-driven. We believe each member makes it better. Sure, they can tout their exceptional air purification system and the 14,000 cigars in their humidors…but it’s more than that. It’s a family. Men, women, travelers from out of town…their patrons are diverse. But one thing they tend to have in common? They return. At Industrial Cigars, your name is known not only by the owners and their team but by the people you sit with. It’s a community. We want our members to feel like a part of the family. Your last name may not be Frakes…but you’re a part of our family. The Frakes family believes the cigar lifestyle should be accessible to anyone and everyone. Cigars have proven time and again to bring people together, and in Frisco, where we have a lot of new residents and transplants from other areas, there’s a lot of value in that. So what can you expect on your first visit? The owners will be glad to show you around. They’ll introduce you to the cigar selection, the amenities, and to the other members. For cigar smokers in North Texas, the market has finally received the cigar lounge it’s been demanding. Whether it’s your home away from home, a place to entertain clients or a source of community, Industrial Cigars invites you to be a part of their family.